I saw that Karnage Asada was going to be at Young Veterans Brewing and I knew I needed some of more of those Kimchos they make. Nachos with Kimchi on them! Seriously, they're good. After work, we hopped in the car and drove over. After taking a quick look at the menu we ordered the Kimchos--adding pork and anything else they'd put on them. We also ordered a "full rack" of tacos and some beans and rice. The full rack had one of each of their tacos and served in the shells fried right there in the truck. Donna in the truck told us that they have a little deal going on with the brewery, if you buy food you get a pint for $2! Perfect. After ordering we went inside Young Veterans, it was Shelby's first time in the shop. She looked around a little and I took her to the bar. Kasey was working the taps and I introduced Shelby to her. I ordered a Pineapple Grenade, their weissen that always kicks quickly, and Shelby got a flight. This was perfect because she hasn't had too many of their beers yet. After finding a place to sit our food was brought in by Donna. You get a ton of food with the large order of Kimchos. Loved the sauce they put over the whole thing in addition to the kimchi and cheese. Shelby liked her tacos but was full after two. I ate about half of what she had in her box and we took the rest home for lunch the next day. I probably could have eaten everything but I was already full and I was at the point of eating just for the sake of eating. It's hard to stop when you're eating something that tastes so good. 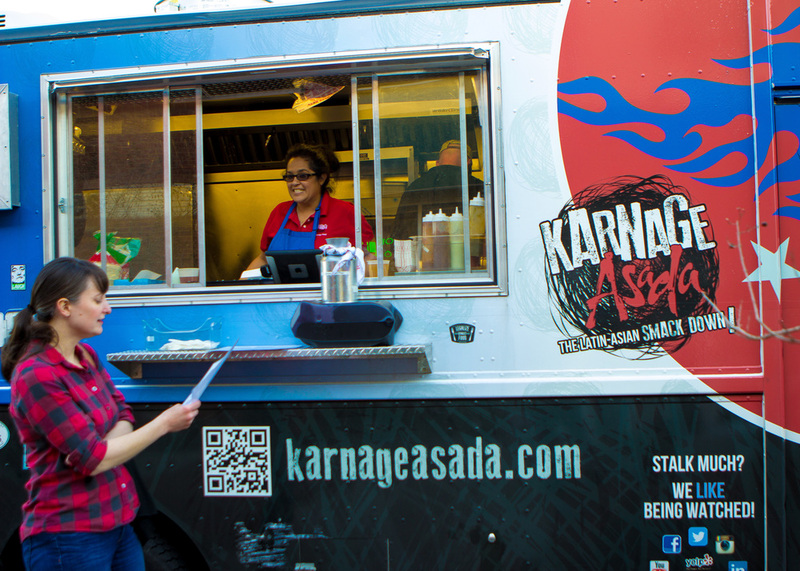 Swing by Young Veterans Brewing Co. and definitely catch Karnage Asada if you see them parked somewhere.